These adorable Oreo Monster pops are the perfect way to treat your little ones this Halloween. 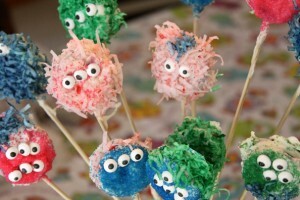 Not only are they fun to eat, but the kids will have a blast making and creating them. Using some cool Halloween colored Oreo cookies these little monster have a hidden Halloween surprise inside! An orange creme filling makes them extra special. Use sprinkles, coconut, and googly eye candies so the kids can create lots of different monsters to share! 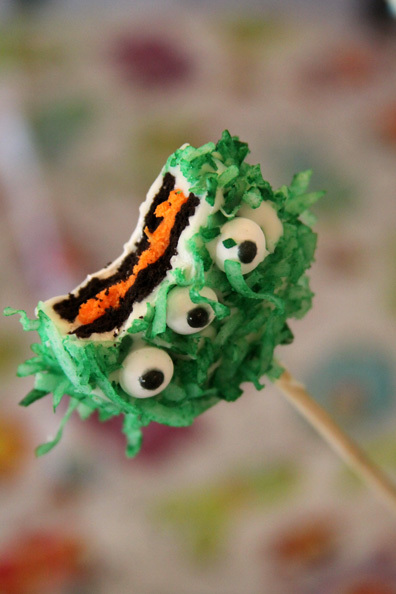 Is there anything better than a cookie on a stick? 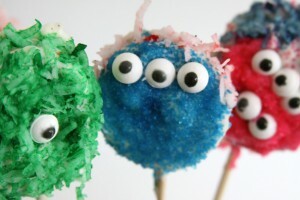 Well, I suppose they are even more fun disguised as adorable little googly eyed monsters. Oreo cookies covered in yummy chocolate and decorated just the way the kids want them make them more fun than just any old Oreo cookie. My favorite part about these little monsters is that when you bite into them there is an added surprise! Halloween colors inside the cute little furry monster. I came up with this idea after last years bat and monster Oreo pops were such a smash at our little family Halloween party. The kids couldn’t get enough of them, and I wanted to make them again, but put a new Halloween twist on them. I also wanted to find a way to get the kids more involved in the process of making them. 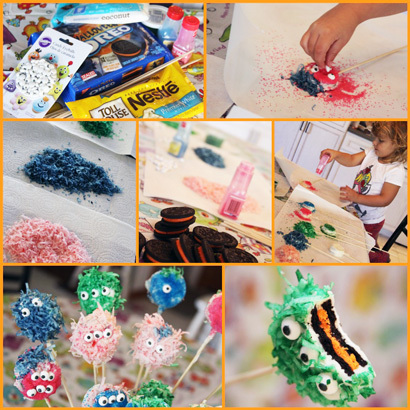 I decided that them making and decorating their own little monsters would not only make a great Halloween treat for them to share, but be an awesome project for us to make in the kitchen together. Oh my was I right, and it didn’t take long for the kid’s to get really creative with the supplies that I put out for them. I started by adding a grilling skewer to the center of my cookies. 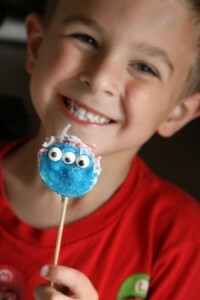 And when they were done we were left with quite the adorable batch of little cookie monster pops! The kids were literally grinning from ear to ear as they decorated their monsters. 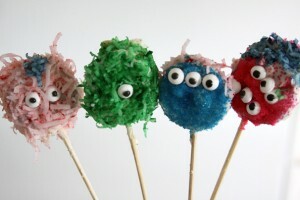 The sprinkles gave the monsters a smoother appearance while the colored coconut made for great monster fur and hair. 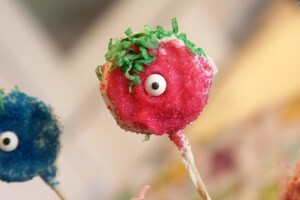 The addition of the Wilton candy eyeballs was the best part of the monsters, and they all seemed to end up with a different number of eyes. I was so excited for the kids when they got them all done and got the chance to pick their favorite creation to eat! They turned out super cute and each monster was unique and silly. Of course my kids did all of the decorating, so they weren’t perfectly or neatly done, but they were perfect to them and that made me happy. With one package of white chocolate chips we were able to cover 12 Oreo cookies to turn into monsters. If you would like to do more grab another bag of chips before you leave the store! You will have plenty of other cookies, eyeballs, and coconut. my only problem with this project is that the cookies were difficult to dip into the chocolate and cover without 1) loosing the stick and 2) the cookie falling apart. I found it a little easier to lay them on wax paper and cover them with the chocolate using a spoon. The backs weren’t quite as pretty that way, but covered with the sprinkles and coconut, it doesn’t really matter. You might like to try candy melts from the cake decorating isle at a craft store for a smoother and more perfectly covered cookie. You can also use Popsicle sticks instead of skewers but I recommend using double stuffed Oreos (which sadly don’t come in the fun Halloween colors). We just hosted a crafty play date and made these. They were a big hit! Almost none actually went home with anyone, they were all eaten right away. I used a big block of white candy coating, since it’s in the store this time of year. I was surprised that it hardened almost immediately, so I had to constantly dip cookies as the kids were decorating instead of making them before everyone got here like I had planned. But it all worked out just fine. so happy they were a hit at your get together! Thanks for commenting and letting me know! !